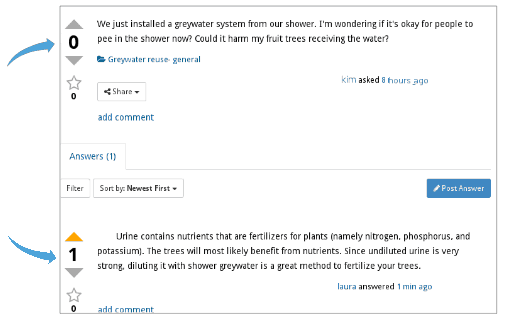 This question and answer forum is moderated by Greywater Action. The goal of this forum is to support people to install, maintain, and live with sustainable water systems. Anyone can view it, registered users can post questions and answers. If you just want to ask a question, all you need to do is make a free account using your email address, or a Facebook, Twitter, or Google account, and read the general info about the forum. If you have any trouble just email us (info at greywateraction.org) and we can manually register you. This forum is all about getting answers. It’s not a discussion forum or a place to chit-chat. Good answers are voted up and rise to the top. The best answers show up first so that they are always easy to find. The person who asked the question can mark one answer as “accepted”. Accepting doesn’t mean it’s the best answer, it just means that it worked for the person who asked. Focus on questions about an actual problem you have faced. Include details about what you have tried and exactly what you are trying to do. If appropriate, upload an image of the problem area. For example, if you aren’t sure where to cut in a diverter valve you could upload an image of the pipes. Not all questions work well in our format. Avoid questions that are primarily opinion-based, or that are likely to generate discussion rather than answers. For example, ‘What kind of greywater system is best?’ is too broad of a question, while ‘I have a slab-on grade house. I’ve been reading about different types of systems but I’m still not clear about my options. What type of systems should I research first?’ is not. When you ask a question, find the most appropriate category for it: Composting toilets, Greywater reuse, or Rainwater harvesting. 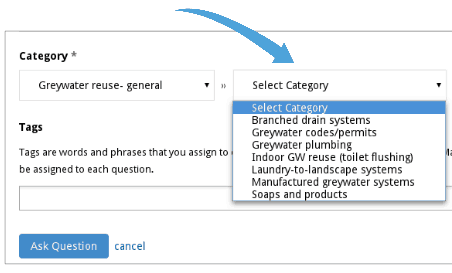 After you’ve selected the category, check the list of sub-categories to see if your questions matches, or if it’s a general question under the main category. Click any category to see a list of questions within it, or go to the list to browse for topics that interest you. Feel free to add any Tags you think would be helpful. When someone answers your question you will get an email (no need to keep checking the forum). When you have recieved an answer you feel adequately answered your question you can accept the answer and the question will be closed for new responses. You can also vote on answers you like best. If you’re experienced with greywater, rainwater, or composting toilet systems, we’d love your input and expertise in answering people’s questions. To participate just make a free account and read the rest of this page, we’ll explain how this forum functions (it’s a little different from other discussion forums). This forum is based on “Stack Overflow” where the best answers are voted up to the top. 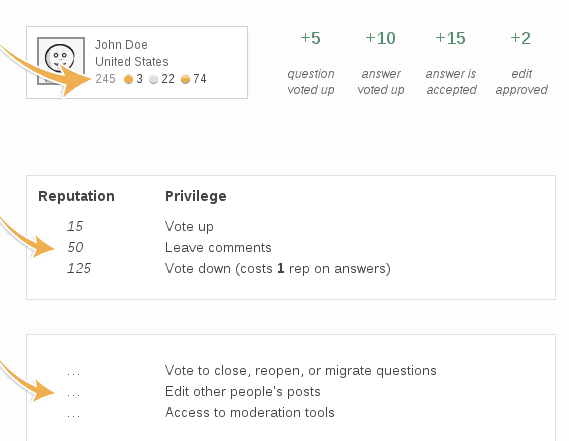 Users who answer questions earn points and reputation, and can help manage the forum to keep it well-organized and easy to find the best answers. As you build your reputation you will have increased privileges, like the ability to comment and edit other people’s posts. At the highest levels, you’ll have access to more editing privileges and can work with Greywater Action moderators to keep the site focused and helpful. You can always comment on your own questions and answers. Remember: we’re all here to learn and support one another, so be friendly and helpful! The International Compost Sanitation Forum and Message Board is an excellent resource focused on Humanure Handbook style compost toilets. The Sustainable Sanitation Alliance (SuSana) forum is an excellent, international resource focused on all aspects of sanitation. *Thank you Stack Exchange for the instructional information for this forum page. Visit the Stack Exchange network to participate in over 100 different forum topics.